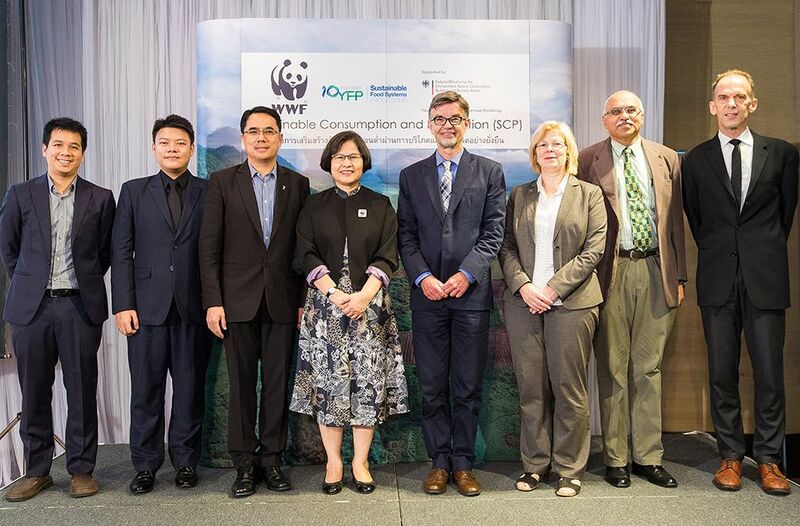 Project kickoff workshop in July 2017 with representatives from the Thai government, WWF, the German Environmental Ministry and UN Environment. From left to right: Ply Pirom, Project Manager SCP, WWF-Thailand; Worapon Mathurosmatanee, Environmentalist, Climate Change Management and Coordination Division, Office of Natural Resources and Environmental Policy and Planning; Dr. Buntoon Sethasiroj, Representative, National Administration and National Reform Framework of Natural Resources Management; Yowalak Thiarachow, Country Director, WWF-Thailand; Dr. Ulf Jaeckel, Director of Sustainable Consumer Protection, Product-related Environmental Protection, German Federal Ministry for the Environment Conservation and Nuclear Safety; Martina Fleckenstein, Policy Manager Food, WWF-International; Dr. Mushtaq Ahmed Memon, Regional Coordinator for Resource Efficiency, United Nations Environment Asia Pacific; Mr.Gordon Congdon, Conservation Programme Manager, WWF-Thailand / © WWF-Thailand. Our approach to SCP includes cooperating closely with the government agencies in the implementing countries. In Thailand, these are the Ministry of Natural Resources & Environment (MNRE), the Office of Natural Resources and Environmental Policy and Planning (ONEP), and the Ministry of Agriculture & Cooperatives (MOAC). In Indonesia, the Ministry of Environment and Forestry is both a partner institution as well as target group for the suggestions on NDC implementation in the agriculture sector. BAPPENAS (National Development Planning Agency) is being engaged for its role as the main government agency for international cooperation as well as the target of SCP inclusion in the national development plan. The Climate Change Commission (CCC), the lead national policy-making body on climate change, is the primary political partner in the Philippines. Given the approach of the project, CCC is providing guidance to other government agencies as to how their respective work can contribute to mitigation actions, as well as identify potential cross-sector synergies for the government agencies to collaborate on.